Home » YouTube » What is Digital Video Storytelling? Online video has become an essential tool for effective digital marketing. Digital marketers have realized the power of online video and are investing in it to reach their targeted consumers. The narrative created by brands viewed from different platforms such as Facebook, YouTube, and Instagram. Digital Video Storytelling option is exciting and has taken the digital marketing into a new era. Why is Video Storytelling Important for Digital Marketing? 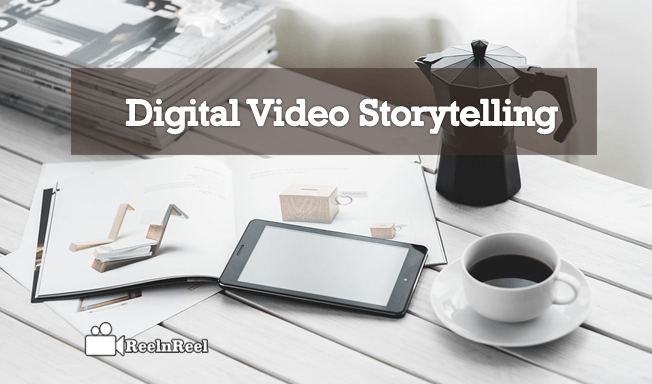 Video storytelling should be used to be authentic in digital marketing. There are few fundamental reasons for this. It’s already proven that video is more powerful than text. When we watch a story, we get connected emotionally with the characters. Human brains are more responsive to motion and imagery. Video storytelling posts shared more than the text posts. When it comes to visual retention content is more efficient. Social media and content marketing are viral now. These have created a lot of opportunities for the marketers who give propriety to video storytelling. Video storytelling is used to connect with the consumers emotionally. The lasting impression can leave with transparent storytelling. Few essential elements should incorporate in the video story campaigns. In digital marketing, it is essential to hook the audience within few seconds of the video. Mention a problem, create tension and then show how the product can resolve the issue. Try pulling the audience by using emotions like sympathy, envy, etc. in the story. Use different emotional as the narrative unfolds to help the audience connects powerfully with the brand. The story should speak the truth about the brand or the product. Authenticity is paramount in the digital era of marketing. The consumer must feel connected to the digital video story. It might be the problem that shows, the characters in the video, etc. Video storytelling is not the solution for all the marketing problems. Done right storytelling can help grow a connection with the audience. The stronger the relationship, the better the view rate, conversions and brand recall. Many famous brands are using storytelling since years to their advantage. When used correctly, the digital video storytelling can help give an identity to the brand. Stories can provide an experience that the audiences will not forget quickly. This will increase lead generation by more than sixteen times. An intelligent call to action included in the storytelling will motivate the prospects to become customers. Any brand can use storytelling technique. Marketers must understand that emotional motive influences the buying decision of consumers. It is thus important to know the emotional motivators of the audience along with demographic information, likes, dislikes, etc. Find the motivators that make high impact and make it the central point in your digital video storytelling. After finding the motivator, decide on a story to tell to the target audience. The story could be a behind the scenes or a video of an existing customer who is using the product etc. Pick a story that can easily connect with the consumers. Think of how to engage the audience. Hook them by asking the audience a question, making a statement, etc. Storytelling is not a new idea. It has a long history and is proved to be a powerful communication technique. Brands that want to make their presence felt online should use the powerful video storytelling to deliver a memorable message. This is how video storytelling can use as a useful tool for digital marketing. Storytelling technique can be used to show the audience the origins of the brand. Tell them the story of the founder. This helps the consumers to connect with the brand in a meaningful way. One of the favourite types of video in digital marketing is the customer testimonial. The story of satisfied customers can be shown to convert prospects into customers. Let the customer tell how the usage of the product improved the life. Show the achievements of the employees of the company. Let the employees talk about the culture and values of the company. Show the special events and programs held in the company. When creating digital video stories, identify the audience and the market that you are going to target. This helps create story relevant to the audience. Make sure that the information you are providing them is accurate. Exclusivity is what audience like more. Show exclusive behind the scenes. Show the people behind the product to get emotional engagement. Identify the message that is to convey through the video storytelling. Keep the video short and sweet. Make sure that the quality of the video is high. Use emotions such as happiness, sadness, laughter or anger in the stories. Make sure that the narrative is compelling so that it captures the attention of the viewers and can arouse curiosity. In this digital age, the most advanced techniques of storytelling are made a part of the video marketing strategy to help create an emotional connection with the audience. Digital video storytelling is going to play a crucial role in the success of any business in the coming days. Start using the robust marketing strategy to promote the brand.